Owing to the flourishing e-commerce industry and surging cross-border delivery, the automated parcel delivery terminals market is expected to witness a progressive growth in the years to come. With new players entering the market and progressing vigorously as compared to the old players, the market for automated parcel delivery terminals is anticipated to be dominated by new players in the future years. The parcel delivery business was into the market for quite sometime and carries a massive rising potential for growth and development. This may take place on account of majority of underserved markets around the world. Another factor fuelling the market is the e-commerce industry blooming which further helps in extending business through online portals as well. The major players of the market are susceptible to oppose the efforts of new players in the market in order to prove their establishment and grasp over the market. However, new entrants successfully manage to earn their revenue by acquiring new strategies. Apart from strategic alliances, the new players are also making counter efforts in the form of extensive marketing and acquisitions so as to bank their abilities and manu8facture advanced and innovative products in the global market. 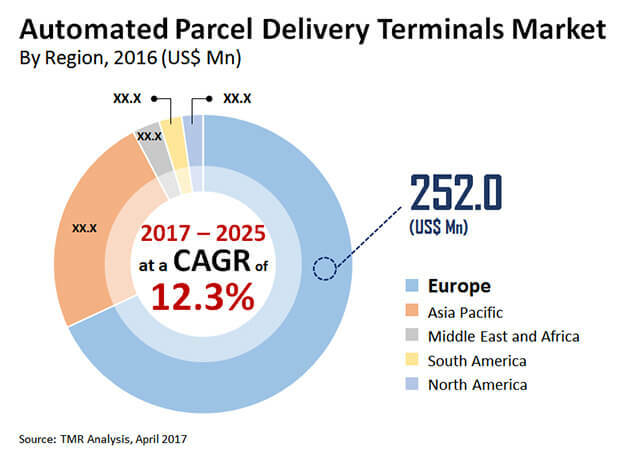 The global automated parcel delivery terminals market is presumed to be worth US$1.039 bn by the end of 2025 with a healthy CAGR of 12.3% . The forecast period is set to 2017 to 2025 and is anticipated to be expanding from US$335.0 bn as per the 2015 records. The global automated parcel delivery terminals market is classified on the basis of type and ownership. On the basis of type, the market for automated parcel delivery is segmented into outdoor terminals and indoor terminals. Amongst the two, the indoor terminal category holds a larger share owing to their affordable cost as compared to their outer terminal counterpart. Indoor terminals segment also enable easy parcel recovery even in difficult weather situations. Not only has this, the indoor parcel delivery terminals also provides protection against vandalism and burglary, thus making them popular among the two. With regard to ownership, the automated parcel delivery terminals market is categorized into government organization, shipping and logistic companies, and retailers. Among these, the shipping and logistics category is assumed to surpass the other segments in terms of growth rate. Since the e-commerce industry is growing at a faster rate day by day, the automated parcel delivery market could also earn more revenue because of the rising number of online orders. The global automated parcel delivery terminals market is studied on the basis of key geographies South America, Middle East and Africa, Asia Pacific, Europe and North America. Taking into consideration the rate of growth of the market in each of these regions, it is seen that Europe is currently dominating the overall market. This is due to the early adoption of parcel delivery terminals through automation by various logistics retailers, companies, and different government organizations. Apart from this, the presence of major players in the European region has also added benefit to the overall revenue collection. Following up with Europe is Asia Pacific region contributing good amount of revenue shares due to considerable progress in logistics ecosystem especially in emerging nations of China and India. Likewise, logistic ecosystem in South America and Middle East and Africa are also accelerating market growth. North American countries namely UAE, the U.S. and Canada are also expected to show similar growth and contribute notably to the growth of the market globally. Some of the key players in the automated parcel delivery terminals market are ByBox Holdings Ltd., Cleveron Ltd., Smartbox Ecommerce Solutions Pvt. Ltd., ENGY Company, and InPost, Cleveron Ltd. The research report provides a comprehensive assessment of stakeholder strategies, and the imperatives for succeeding in automated parcel delivery terminals market. The report includes competitive analysis of various market segments based on deployment type and ownership for automated parcel delivery terminals, and in-depth cross-sectional analysis across different geographical segments of the automated parcel delivery terminals market. In order to aid in strategic decision-making, the report also includes the winning strategies adopted by key players. The report segregates the automated parcel delivery terminals market based on different geographies into North America, Europe, Asia Pacific, Middle-east and Africa and South America.